Before delving deeply into the philosophical argument for this, we first have to review the concept of sainthood in terms of many of the other examples that are out there. There are numerous saints that Tschoop could be compared with. So many saints in fact it would be difficult not to find a character that he could be likened to. But it is not just character that helps define the parallels between a saint and someone like Tschoop. We have to consider as well what missionary agents felt about Tschoop, along with the upper echelons within the church setting with offices back in Europe. Even more important perhaps, the requirements for sainthood aren’t as easy to define as the requirements for something like your first communion or how to engage in an official church wedding. The various life experiences Tschoop had to experience in order to qualify him for future beatification or sainthood may or may not exist, and if they do exist, they may or may not resemble the life experiences which one or more of the other saints had. Finally, since sainthood is perhaps too high a goal for this time with my discussion, we have to keep in mind the possibility of Tschoop simply becoming a Servant of God or a Venerable. Whatever the outcome, the route this argument needs to take is neither set in stone nor one that I personally expect to see some ultimate outcome for. Even becoming a Venerable can take a half century or more to happen, beginning at least five years after the candidate was deceased. What Saint does Tschoop compare best with? Are there certain saints that closely resemble him due to the type of life they lived? Are there certain occupations that these saints had which best represent the work performed by reborn Tschoop, such as the work of the Apostles? the Martyrs? the Confessors? Another way to look at the answers to these questions is to ask yourself what particular identifiable personality features for the saints relate best to Tschoop’s most pronounced features? Could an individual like Tschoop possibly be defined by some unique statement that he made which parallels another unique statement made by another saint. Could an Indian like Tschoop, with such a trying life, also ask these same questions previously posed by Saints? Therefore, indeed, I cannot keep silent, nor would it be proper, so many favours and graces has the Lord deigned to bestow on me in the land of my captivity . . .
Of course the above is a fairly superficial method for defining a saint or two that Tschoop possibly represents. Whenever we try to remember and understand a saint based on some unique personality, we often make the mistake of looking at the notion of sainthood as if it were something that is easy to understand. The truth is–-achieving sainthood is an event that is hard to predict. This is due to the miracles that are required for someone to be considered a saint. Most of the time, the defining requirements for becoming a saint are neither preconceived nor planned in life by those who become saints. So looking back at the past requirements for reaching sainthood will not allow us to predict even better what the future requirements for sainthood might be. Nor will such an attempt provide us with more insight into the true direction that past and modern canonization-sanctification processes are taking. So, instead of trying to understand the thinking of the Vatican when it comes to defining the mysteries of becoming a saint, we are better off reviewing the character of saints and saints-to-be in as much detail as is possible. We can then add to this our interpretation of what we felt the missionaries were thinking about regarding someone like Tschoop, especially when they gave him the baptismal name that they did. We can then dig deeper and find whatever questions were left unanswered, questions that are no longer superficial, philosophical and overly ideological in nature. In other words, there is more to understanding sainthood and its predecessors than just trying to answer a few basic questions, and relating these findings to the American Indian within the North American church setting. Finally, before I begin, I have to state that there are some culturally sensitive issues that must be addressed here. Imagine sitting in a classroom, learning about your own cultural demise, being asked to listen to and heed by what is being told to you. This is especially true for modern times. If one were Iroquois for example, he or she might never understand how and why we can define some of our saints based on particular life tragedies, for example when tragic events responsible for matyrdom are actually the result of a carefully aimed arrow or adz. A young Iroquois child attending this local missionary ’s lecture might wonder: why do we bestow sainthood on someone like this? Why is St. Isaac Jogues a Saint after all that he and others have done? (For example, exposed them to the measles adn small pox.) What about St. John Lalande? or St. René Goupil? How do their virtues compare with the others you teach us about, individuals like St. Francis of Assisi or St. Augustine of Hippo, saints who were very much in touch with the Creator when they were people? Unfortunately there is no solid answer to this question. So be it. This reminds me of another unofficial religious phrase–forgive and forget. To continue on the theme produced in the prior sections on baptisms and names, three saints are once again reviewed. First there is Saint John the Baptist, someone whose life is very much that of the natural theologian and natural philosopher, like the lives engaged in by many American Indian during the Moravian Mahican missionary period. In he beginning we are uncertain as to whether or not the “John” which Tschoop received as his baptsmal name refers to John the Baptist, a minister who provides his service in the the wilderness, or some other John. Second, there is a review of the Book of Job, the name which sounds like the way “Tschoop” was actually pronounced by the Dutch. More than likely the name Job was associated with Tschoop due to the resemblances of this name to some name used by locals for Tschoop, before the spelling ‘Tschoop’ became the standard used by story tellers and history writers. 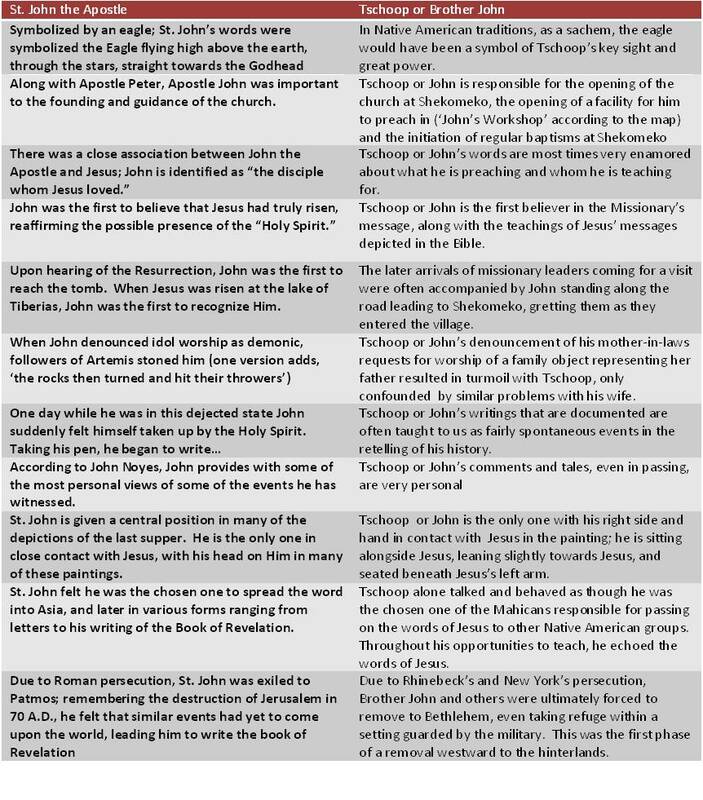 Although Job himself isn’t exactly a saint, he is an individual who missionaries could very well have used as Tschoop’s baptism name, were it not for the fact that one other individual, who is a Saint, compares better with Tschoop’s life experiences than Job. The individual Tschoop relates most to in the Bible is that John who is so important to Bible history that he is known as St. John the Apostle. It was the decision of the missionaries to recognize and encourage the fact that Tschoop’s or John’s life and enthusiasm as a preacher was best equated with that of an Apostle, one of the first of the few to follow the new teachings of Jesus during its earliest days, months and years. Jesus’ closest companion during the last supper, the one seated most closely to Jesus and who was there when he was most needed, that is the John that the Moravian missionaries were comparing this sachem to. As just stated, Tschoop is probably baptized as John due to his similarities to John the Apostle. However, the other John, John the Baptist, does have some important comparisons that need to be noted. In Matthew 3:1-2 we can see a parallel between St. John the Baptist and Tschoop: “In those days came John the Baptist, preaching in the wilderness of Judaea, and saying, Repent ye: for the kingdom of heaven is at hand. For this is he that was spoken of by the prophet Esaias, saying, the voice of one crying in the wilderness, prepare ye the way of the Lord, make his paths straight.” This parallel is superficial for the most part, but worthy of review in case there are any malingering doubters of the conclusions I drew in my reviews of the Baptismal names. During the years of the Apostles, John the Baptist (not the other Apostle John) was known for preaching in the wilderness of Judea. His most famous line is “Repent, for the kingdom of heaven is at hand!”, but in Tschoop’s case we are better off considering Luke 3:2,in which we find the story about John the Baptist travelling throughout Jordan, providing each listener with a chance for a baptism of repentance, symbolic of a remission of their sins. Referring to the words of Isaiah the prophet, Luke writes: “The voice of one crying in the wilderness: Prepare the way of the Lord; make His paths straight. Every valley shall be filled and every mountain and hill brought low; the crooked places shall be made straight and the rough ways smooth; and all flesh shall see the salvation of God.” This very much matches the perception we should be left with regarding St. John the Baptist as the true relationship to Tschoop’s baptismal name. St. John the Baptist’s attiudes and behaviors are very much American Indian like in nature, but lack any deep relationship with much of Tschoop’s other personal choices regarding living practices. Tshoop was too much of a pacifist to be a rabble rouser like John the Baptist. For this reason, St. John the Baptist is excluded from the John that Tschoop was related to by the missionaries. St. John the Baptist’s story provides us with just a few circumstantial features that barely compare with Tschoop’s life as an Indian. For more on this part of the Bible most related to Tschoop, we must turn to the Old Testament first, and the story of Job. The story of Job has previously been discussed as a part of the Bible many early and later writers found could be related to Tschoop’s history and biography. The Exegesis of Job can be related to a couple of philosophical questions Tschoop might have been asking in the months prior to meeting Rauch: could my misfortune be a consequence of something else I have wrongfully done? could it be some form of punishment forwarded to me by the Creator? This could have of course been a question he posed in reference to his medical condition(s). Like Job, Tschoop may have felt he was a righteous man, and need not be punished for anything, relating his misfortune to other possible causes. Were the Creator to behave in such a fashion, the question he would be led to ask is ‘why?’ Tschoop confesses to this in part on his own in a much later discussion of his reasons for converting . It is said that in the Bible, Job’s wife urged him to ‘curse God, and die.’ Job’s response to her was ”The Lord giveth, and the Lord taketh away; blessed be …” (Job 1:21). In one of Tschoop’s tales, we are told about how his mother tried to convince him and his people to engage in “idol worship,” a behavior also not supported by the stories related to Job. Satan becomes an important part of Job’s story as well (he who was responsible for the worst of Tschoop’s performances), by trying to attack Job on numerous occasions, ultimately without success. Job also had two companions, both of whom are ‘coincidentally’ found in the Mahican baptismal names for two of his neighbors–Abraham and Jacob. An existential interpetation of Tschoop’s/Job’s character would define these experiences as a battle between personal intellectual reasoning and faith. (see Harold Kushner’s When Bad Things Happen to Good People, 1981.) Like Job, Tschoop perhaps had some personal questions for the creator regarding his fate. He probably asked whether or not he should believe in the image of the “pearly gates” possibly mentioned to him by the Moravian missionaries. According to pre-Christian philosopher and Theologian Classicist, a believer in the traditions, Maimonides stated “a simple and perfect person who is upright in his actions… is afflicted by successive misfortunes”, in other words “Job’s disaster does not come about because of his wickedness but, on the contrary, because of his outstanding righteousness”. According to Epistle of James, Tschoop was an example of “suffering and patience”. To Moravians, he symbolized the “pure white lamb” innocent of many of life’s tragedies. To the members of the Catholic church, Tschoop was “a virtuous man who experienced suffering, . . . a type and prefiguration of the crucified and resurrected Christ”. “The whole book [of Job ] is one uninterrupted contest between the ‘cries’ of the much-afflicted Job and the ‘reflections’ of his rational friends. The friends, as true thinkers, look not at Job but at the ‘general.’ Job, however, does not wish to hear about the ‘general’; he knows that the general is deaf and dumb – and that it is impossible to speak with it. ‘But I would speak to the Almighty, and I desire to argue my case with God’ (13:3). The friends are horrified at Job’s words: they are convinced that it is not possible to speak with God and that the Almighty is concerned about the firmness of his power and the unchangeability of his laws but not about the fate of the people created by him. Perhaps they are convinced that in general God does not know any concerns but that he only rules. That is why they answer, ‘You who tear yourself in your anger, shall the earth be forsaken for you or the rock be removed from its place?’ (18:4). And, indeed, shall rocks really be removed from their place for the sake of Job? And shall necessity renounce its sacred rights? This would truly be the summit of human audacity, this would truly be a ‘mutiny,’ a ‘revolt’ of the single human personality against the eternal laws of the all-unity of being!” (Speculation and Apocalypse).” (see http://en.wikipedia.org/wiki/Book_of_Job and http://en.wikipedia.org/wiki/Lev_Shestov). In the end, Tschoop was neither St. John the Baptist nor Job of the Book of Job in the eyes of the missionaries. St. John the Baptist was too “wild” to be the born again Tschoop, who was now very learned and more like a very domesticated “Lamb of God.” Job was just too simple of a comparison for the Moravians to make–the name Tschoop means Job, and was pronounced Job; Job or Tschoop was the chieftain’s pre-baptismal European name. Now that he has been baptized, Tschoop deserves a better more meaningful name. The writers of this part of Mahican history and John’s transformation make this latter point about Job or Tschoop numerous times, and their preference for the baptismal name John. In Loskiel’s book, Loskiel mentions his source of this popular phrase as an ancient hymn repeated to him by Anthony Seyffart, in a letter dated 1743. . . The second option, Job, was therefore simply too superficial an individual to be likened to Tschoop. Job’s sometimes demonic like behaviors were not only unlike Tschoop’s role with his people–Tschoop was not their shaman–they were also too superficial and overly exagerated at times to be the more people-loving non-violent pacifist that Tschoop had become. Tschoop was too peaceful to be associated with such things as hatred, war, social discontent, and other behaviors and attitudes born due to one’s own personal demon. For this reason, of the three above Saints most closely associated with Tschoop’ past names and personality, only Saint John the Apostle best fits Tschoop’s complete character, inside and out. I believe that by knowing the character of Tschoop and understanding his baptismal name, we can now interpret many of the events he engaged in according to Loskiel’s writing and interpretations of these events. The truthfulness of the story of Tschoop may be questionable due to this feature common to Christian writings during this time in history, but these events that Tschoop or John experience may have also been expected and predictable. Missionary writer and historian Loskiel had two intentions for producing his work. As I have previously pointed out one of these was more than likely to promote the goals and teachings of the Moravians in general, as a worldwide educational goal. But there are really so many parallels between Tschoop and St. John, and others who are gifted and who have matching religious icons or Saints, to simply state that all of these similarities are due to coincidence would be in error. It appears such was not the case for Kateri, a converted Mohawk of the 17th century. Such is also not the case for Brother John. There are two ways in which these parallels may be initiated, and two ways in which they can be continued, as if each of these is required for each story in history to also become an important legend. This human factor in storytelling and retelling history (not necessarily reconstructing history), therefore, exists for good reason. There is the human-generated reconstruct of these sacred stories. But there is also fate, a more important way in which Saints’ lives are constructed and reconstructed, in much the same way, over and over again throughout time. We can look at Tschoop and decide that he alone set the goals of behaving a certain way, not knowing that this matched the life of a particular saint. We can also decide that we want to accept the possibility that the story of Tschoop is instead a legend, reworded to fit its later needs by new teachers, storytellers and their students. Or perhaps it is a little of both, designed to teach as well as convert. 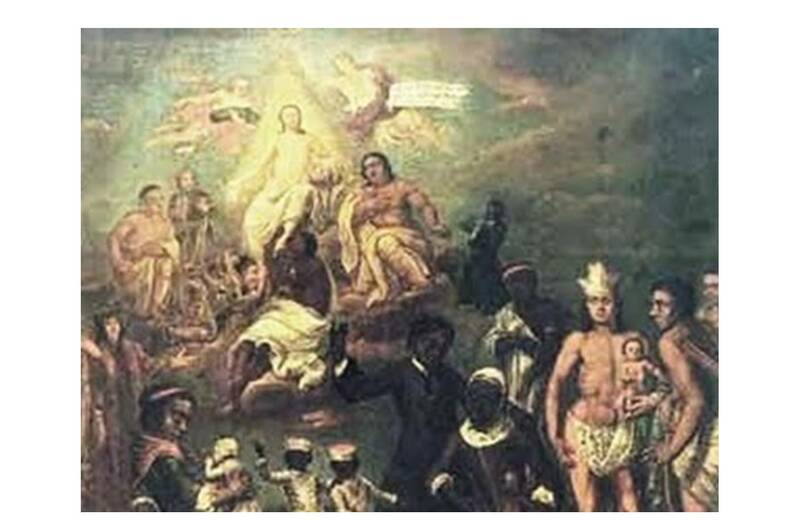 Is it simply coincidence that Tschoop happens to be seated to the left of Jesus in the painting First Fruit? If we don’t believe in “coincidences” as being intentional, we need only look at other supporting evidence for any claims that could be related to them. Tschoop earned his name due to an outsider (Rauch) witnessing his conversion and changes in behavior, for as long as he actually knew Tschoop “the Traditional Indian-turned Christian Indian”. This outsider is the one to draw the parallels between Tschoop and John the Apostle, not Tschoop. Another outsider, the artist of the painting above, also placed Tschoop where St. John is best known to be seated, on Jesus’s left side. Tschoop is thus seated there for some reason in the artist’s mind. Still more can be said to better understand Tschoop’s or Brother John’s place in the missionaries spiritual world. In other cases of taking on a Saint name, he/she who selects that name has special reasons for this change. Such was the case for another individual, now Saint, who Tschoop will be compared with later on (see also on another web page discussing sainthood and Tschoop–the page on Father Damien). Both Tschoop and the Native American Blessed Katerie received their baptism names because their life story proved this need for such a name. Perhaps Tschoop deserves this recognition as well. Their life stories are not just the consequences of their life once they received these new names.